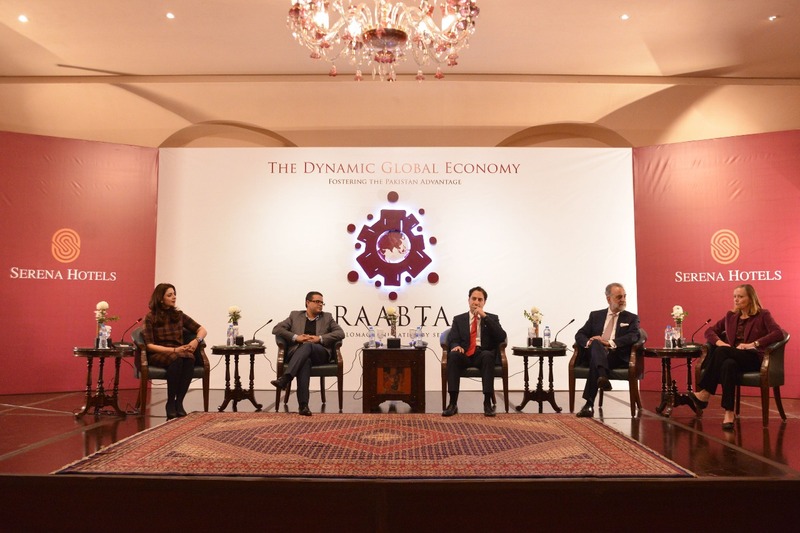 Serena Hotels hosted an evening of dialogue and discussion, under Raabta, a Public Diplomacy Initiative, on ‘The Dynamic Global Economy, Fostering the Pakistan Advantage’. The panel of experts, moderated by Sidra Iqbal, included Zohair Khaliq, Member of the Prime Minister’s Task Force on IT and Communications, Melinda Good, Manager Operations at World Bank Pakistan, Sarim Sheikh, President and CEO of GE Pakistan, and Hasaan Khawar, international development and public policy professional. Melinda Good said, “We’ve been looking at two trajectories for the country between now and its hundredth birthday, which is 29 years from now. One is the business as usual which has the country growing at about 5% as it has done historically and the population growing at 2.4%, a rate which is the highest in the region. That means more people are dividing the pie. The other trajectory is the optimistic one, where on its hundredth birthday, growth has accelerated, the difficult reforms have been done, and you’ve been able to invest in health and education, more women have joined the work force and these will moderate the population and Pakistan is in the upper middle income status. So what we need to talk about are the key reforms that need to be made which I think are looking at competitiveness and improving the investment climate, increasing the fiscal space, inclusiveness and human capital investment.” Zohair Khaliq said, “There is going to be a huge demographic shift from the traditional economies of the West to the more emerging economies. According to an HSBC report, Pakistan is going to be one of the five fastest growing economies of the world; Of course this depends on a lot of things and we can’t do business as usual. I think the government should focus on four things. We have to all start paying taxes, the tax to GDP ratio is shocking. Our population growth rate is unsustainable. We are desperately short of energy and will be in the future – the immediate answer is solar energy. Finally, everything we do should be underpinned by technology”. Sarim Sheikh said, “In 2011, I chose to move back to Pakistan because I strongly believe that Pakistan has immense unrealised potential. What I would like to say to everybody is that there is no need to panic; there is a huge opportunity to address the issues. The global demand versus Pakistan’s own current account and fiscal deficit are in a bad state and you could end up in a stagflationary environment. There is also the changing future of work globally many jobs will disappear because of automation, digitization and artificial intelligence. We have to think about these things for the near and medium term”. HasaanKhawar said, “I want to talk about opportunities and challenges. Pakistan is the fifth largest country in the world but its neighbours are the world’s largest country and the world’s second largest country. The three of us account for 1/3rd of the world’s population. If this is not an opportunity I don’t know what an opportunity looks like.